Contemporaries Friedrich Albert Fallou, the German founder of modern soil science, and Vasily Dokuchaev, the Russian founder of modern soil science, are both credited with being among the first to identify soil as a resource whose distinctness and complexity deserved to be separated conceptually from geology and crop production and treated as a whole. As a founding father of soil science Fallou has primacy in time. Fallou was working on the origins of soil before Dokuchaev was born, however Dokuchaev's work was more extensive and is considered to be the more significant to modern soil theory than Fallou's. One interesting effort drawing in soil scientists in the USA as of 2004[update] is the Soil Quality Initiative. Central to the Soil Quality Initiative is developing indices of soil health and then monitoring them in a way that gives us long term (decade-to-decade) feedback on our performance as stewards of the planet. The effort includes understanding the functions of soil microbiotic crusts and exploring the potential to sequester atmospheric carbon in soil organic matter. The concept of soil quality, however, has not been without its share of controversy and criticism, including critiques by Nobel Laureate Norman Borlaug and World Food Prize Winner Pedro Sanchez. ^ H. H. Janzen; et al. (2011). "Global Prospects Rooted in Soil Science". Soil Science Society of America Journal. 75 (1): 1. Bibcode:2011SSASJ..75....1J. doi:10.2136/sssaj2009.0216. ^ a b c Ochoa-Hueso, R; Delgado-Baquerizo, M; King, PTA; Benham, M; Arca, V; Power, SA (February 2019). "Ecosystem type and resource quality are more important than global change drivers in regulating early stages of litter decomposition". Soil Biology and Biochemistry. 129: 144–152. doi:10.1016/j.soilbio.2018.11.009. Retrieved 6 December 2018. ^ Pielke, Roger (12 December 2005). "Is Soil an Important Component of the Climate System?". The Climate Science Weblog. Archived from the original on 8 September 2006. Retrieved 19 April 2012. ^ "Vernacular Systems". Archived from the original on 6 March 2007. Retrieved 19 April 2012. ^ Buol, S. W.; Hole, F. D. & McCracken, R. J. (1973). Soil Genesis and Classification (First ed.). Ames, IA: Iowa State University Press. ISBN 978-0-8138-1460-5. .
^ C. C. Nikiforoff (1959). "Reappraisal of the soil: Pedogenesis consists of transactions in matter and energy between the soil and its surroundings". Science. 129 (3343): 186–196. Bibcode:1959Sci...129..186N. doi:10.1126/science.129.3343.186. PMID 17808687. ^ Hansen, Bjarne, Per Schjønning, and Erik Sibbesen. "Roughness indices for estimation of depression storage capacity of tilled soil surfaces Archived 25 August 2017 at the Wayback Machine." 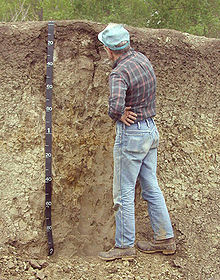 Soil and Tillage Research 52.1 (1999): 103-111.